Click here for an Interactive map of sites that lists the various locations where WTCC ESL classes are held. Click on any location to get location address, telephone and directions. Unless noted, all sites provide ESL Level 1 thru 6. Some sites provide additional classes as noted. Not all additional class are provided each semester. 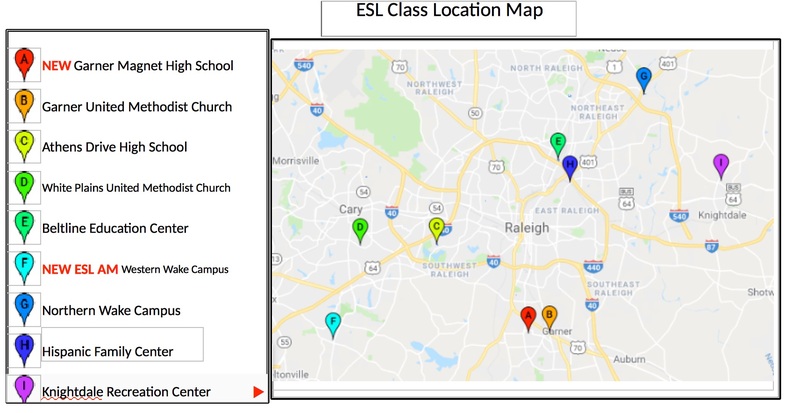 Western Wake is now offering morning ESL classes as of April 2019. A new site Garner High School is now open as of April 2019. The Millbrook High School location is closed as of January 2019. Afternoon MTWTH 12:30 p.m. – 3:30 p.m.
Evening MTWTH 6:30 p.m. – 9:30 p.m.
Free preschool program available for children age 3-4 whose parents are attending class. Spaces are limited so register early.